We embrace a wellness model of dental care that strives to prevent dental problems before they happen. By combining the latest dental research with an in-depth consideration of your particular situation, we can collaborate on a plan that addresses your present needs, but also identifies those areas where you are at greatest risk for having problems down the road. We believe tooth decay, gum disease, and tooth wear are preventable. We look forward to being your partners in preserving your natural teeth for life. Staining and gum recession have prematurely aged this woman's smile. With gum work, veneers, and crowns, the smile is not only brightened, but the edges of the teeth are leveled front and back. Also, the dark, shadowy corners of the mouth "before" are filled out for a harmonious result. Dental veneers are custom-made porcelain shells bonded to the front of teeth to improve the appearance of your smile. Standard veneers can correct a wide range of aesthetic issues including crowded, rotated, or discolored teeth, and require less tooth reduction than crowns. In addition, we now offer ultra-thin veneers, which in many cases can be bonded on top of your existing teeth, with no drilling needed. We look forward to evaluating your smile to determine which kind of treatment will work best for you. 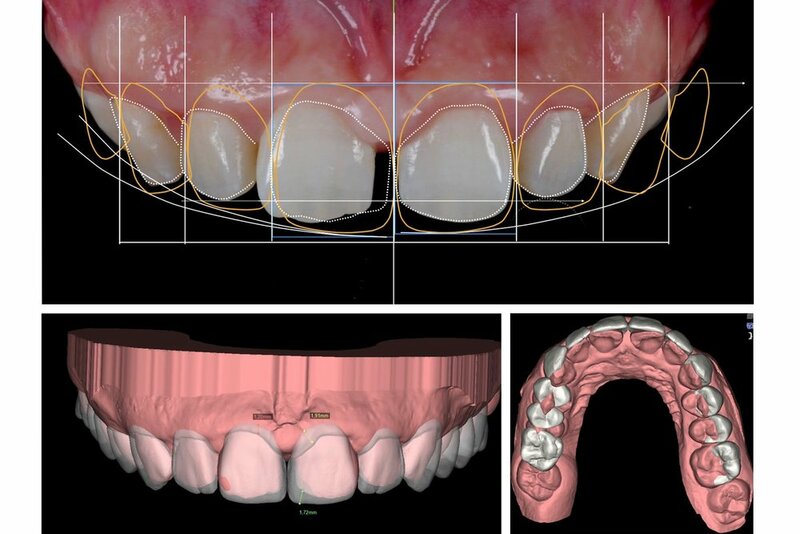 We are pleased to offer our patients access to Digital Smile Design (DSD), the most precise, sophisticated system for planning the look of your new smile. By collaborating with design technicians in Spain, DSD allows us to precisely control the size and shapes of your teeth to fit harmoniously in your face and smile. Invisalign® clear aligners are an excellent option for correcting crowded or misaligned teeth. The digitally generated aligners are virtually invisible and fit snugly over your teeth. As you progress through the sequence of aligners, your teeth gradually move into ideal position. Contact our hill country office for a complimentary Invisalign evaluation. Dental implants are used to replace missing teeth or to support dentures. We will connect you to best surgeons in Austin to place your implant(s), and then go above and beyond to create a beautiful, natural tooth, in collaboration with our world-class laboratories. This team-based approach means you get expert care at each stage of this process for the best aesthetic result. Contact our Austin office for a consultation. This man's front teeth "before" demonstrate the limitations typical of older dental materials. Our world-class laboratory and new dental materials in our Austin, TX office make this dramatic improvement possible. Dr. Katz's exacting system of diagnosing each smile ensures that the teeth are appropriately sized and fit beautifully in the face. Gaps between teeth can be closed, if desired, with braces, composite, or porcelain. In this case, small pieces of porcelain (mini-veneers) were added to the two front teeth, resulting in a dramatic enhancement of the smile and overall appearance with virtually no loss of natural tooth structure. Excessive wear of teeth is a common condition that gives the smile a prematurely aged appearance. Worn teeth may be restored with composite, veneers, or crowns. An excessive display of gum tissue can draw attention away from a beautiful smile. We have the expertise to determine the cause of your gummy smile, and recommend an appropriate treatment. Dentists in our Hill Country office work in conjunction with a gum specialist (periodontist) to raise the level of the gum tissue for a more harmonious proportion. In addition, veneers and crowns add length to worn teeth, and eliminate dark, black margins around old metal restorations. You probably know that untreated gum disease can lead to tooth loss, but you may not know how gum disease impacts your whole body, causing heart disease, stroke, Alzheimer’s disease, dementia, diabetes and many more. We are pleased to offer a new non-surgical treatment for patients with gum disease. Our intensive gum care program uses a simple swish-and-spit test to find out what kind of harmful bacteria are living in your mouth, and tailor treatment to remove it. If you have struggled to manage gum disease in the past, we invite you to discuss this modern treatment protocol with us. Bruxism is the clenching of your jaw or of your teeth to excess, either during the day or at night while sleeping. Bruxism (tooth grinding) can cause damage to the teeth and jaw pain. We will work with you to identify why your teeth are wearing down, and develop a plan to stop the wear and repair the tooth structure you have lost. Treating bruxism can involve re-shaping the teeth for a better bite, or a night guard to protect your teeth and relax muscles during sleep. Jaw pain can be the result of a variety of dental and orthodontic issues. Dr. Steve and Dr. Jerry are skilled at identifying the source of your jaw pain and treating it accordingly to relieve your pain as quickly as possible. Halitosis, or bad breath, may be a sign of underlying dental issues such as cavities or gum disease; other causes include infection of the mouth/nose/throat, dry mouth from medication, and smoking. Most commonly, halitosis stems from bacteria that live on the back of the tongue and emit VSC's (volatile sulfur compounds). With a proper cleaning and exam, our dentists can help rule out any oral health problems and guide you on next steps, including simple changes you can make in your routine that really work to rid you of bad breath. Temporomandibular joint disorders, commonly known as TMJ, may occur as a result of issues with the jaw, jaw joint, and the surrounding facial muscles that control movement of the jaw. You may be suffering from TMJ symptoms if you're experiencing tenderness or pain in the face/jaw area/neck/shoulders, a clicking sound when opening or closing the mouth, chronic headaches/toothaches/neck aches, or tinnitus. Our hill country practice offers various TMJ treatments, including a special night guard (e-appliance) designed to relax muscles, a deprogrammer to evaluate for bite problems, and equilibration, or shaping the teeth to create a balanced bite. After examining how many natural teeth you have lost, our dentists can provide you with complete (full) dentures, partial dentures, or dentures which snap into implants. Our dentures are made over several appointments so we can preview the look in wax and make changes along the way for a predictable result. Our world-class lab in Kansas gives you a beautiful, natural looking appearance. Come in to our Austin office for an examination to receive more information from our dentists about choosing the right dentures for your mouth at the right time, and how to care for your dentures long-term. Tooth pain or sensitivity can be the result of several health issues, but could be a sign of infection. Inside each of your teeth, there is living tissue with arteries, veins, and nerves. This is why you feel the sensations of pressure, hot, and cold, which are especially exaggerated when you've contracted an infection and your mouth is swollen. If you are experiencing tooth pain, wisdom tooth pain, or tooth sensitivity, please give us a call right away and we will do our best to see you as quickly as possible.